With 2008 less than a day away at time of writing, it seems only appropriate to take a look back at the blogging highlights in the Caucasus for 2007. Certainly, although blogging is still largely underdeveloped, the year has seen some major highlights, especially with regards to stories that also made headlines worldwide. In the past this has not been the case, but the signs for Armenian and Georgian blogging look very promising indeed, and not least because the first two months of 2008 will see crucial presidential elections take place in both republics. Although the same might be true for Azerbaijan as its presidential election scheduled for late next year looms closer, the elections seem to have encouraged citizens, activists and journalists to blog. Other high profile events also seem to have pushed more bloggers to engage in online discussion on key issues, especially in the arguably more evolved Armenian blogging scene. Interestingly, however, the first major blogging event of the year came on 19 January 2007 when journalist and editor, Hrant Dink, was murdered in Istanbul, Turkey. Although Dink was a Turkish citizen and resident in Armenia's neighbor to the West, he was also an ethnic Armenian and prolific in his calls for reconciliation between Armenians and Turks. His views might have alienated himself from the larger Armenian Diaspora who consider that Genocide Recognition is the most important issue facing Armenians today, but the point was that his assassination shocked the world, including many Turks in Turkey itself as well as those with no links to Armenian circles at all. Such a reality was reflected in the blogosphere with many more non-Armenians blogging and commenting on Dink's death. 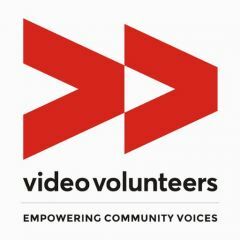 As I wasn't writing for Global Voices Online at the time, I tried to include links and quotes to as many voices as possible on my Oneworld Multimedia blog. Indeed, the first major reaction came from Turkish bloggers. One of those was The Infidel. Hrant Dink was murdered in a heinous and cowardly way, most likely, by some brainless and lost ultra-nationalist Turkish young man, who I hope will be brought to justice as soon as possible. I am deeply saddened by Hrant’s death because I believe that he had good intentions for Turkey and the Turkish people. Although I don’t agree with everything he said and wrote, it is clear that he was a peaceful activist voicing his norm-opposing views to raise awareness, which is the bread and butter of any democracy. No human being should be persecuted for his/her opinions in any country, but especially in Turkey. Turks cannot and should not under any circumstances ignore Hrant’s or any other journalist’s assassinations. This is a shameful act in light of our country’s image and will only be held against us as a whole if the assailant is not pursued and brought to justice adequately. Indeed, even though after his murder most Armenians only started to think of Dink as one of their own, especially when in the past many had ignored his calls for reconciliation, the amount of conversation in the Turkish blogosphere exceeded by far the amount in its Armenian counterpart. 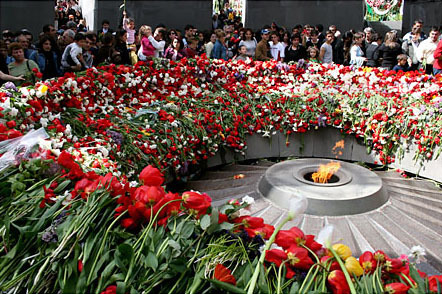 Even a vigil staged in Yerevan was eclipsed by his mass funeral in Istanbul on 23 January 2007. As more and more Armenian bloggers started to react to the news in more detail as well, Global Voices Online's Deborah Ann Dilley put together a digest of reaction which soon spread to well outside the Armenian and Turkish blogospheres. For once, perhaps, the conversation truly became global. To much surprise (which I will show in a few more paragraphs) citizens of Turkey took to the streets chanting “We are all Armenians, We are all Hrant Dink”. Erkan's Field Diary reports of widespread Turkish condemnation of the murder and also points out that Dink is the 62nd Turkish journalist that has been assassinated since the founding of the Republic of Turkey. The discussion continued a week later. Actually, it continued for long after that, with the most recent news being that Dink was posthumously made World Press Freedom Hero by the International Press Institute in December. Dink's untimely death continues to be a focus on my blog and that will likely continue to be the case for 2008. Regardless, while this event marked the first major blogging event in this region, Dink was resident outside of the Caucasus. Instead, and as befitting the former Soviet Union, the first real event of note inside came with the 12 May parliamentary election in Armenia. Again, not writing for Global Voices Online at the time, my coverage of arguably one of the most important defining elections in Armenia's short history as an independent post-Soviet State was on my own blog. However, unlike past elections, and even the more recent constitutional referendum held in 2005, there were others as well. In particular, a new blog, The Armenian Observer, became established in the Armenian blogosphere, and media outlets such as Internews started to incorporate elements of blogging in their election coverage via sites such as E-Channel. However, with the traditional opposition lacking support in society and widespread apathy among the population as well as a relatively clean bill health from the international community, the potential for blogging during elections was not yet realized. Nevertheless, Mary Joyce, Zephyr Teachout and Solana Larsen's Election Blogging Guide was translated into Armenian and made available online just in case. However, another issue first made international headlines and again pushed the Armenian blogosphere global. As was the case with Hrant Dink's murder, an eventually aborted attempt to have the 1915 Armenian Genocide in Ottoman Turkey recognized as such by the U.S. Congress took center stage. With other related concerns such as the supply and safety of U.S. troops in Iraq at stake, the conversation became louder and more detailed outside of the Armenian and Turkish blogospheres. It's not often that Armenia makes international headlines across the globe, but when it does it's usually because of one issue that remains fiercely debated until this day — the massacre and deportation of as many as 1.5 million Armenians from Ottoman Turkey in 1915-17. 22 countries recognize the events that occurred towards the end of World War I as genocide, a charge that the modern-day Republic of Turkey refuses to accept even though the term was devised by Raphael Lemkin in 1943 with the Armenian and Jewish experience in mind. 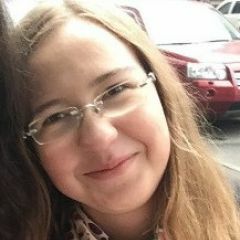 Yet, given that the resolution first and foremost concerned Armenia and Turkey, two countries which share an albeit closed border and which have not established diplomatic ties mainly because of the international campaign for Genocide recognition, the bulk of posts on this subject primarily came from American and English bloggers. To begin with, this was because prior to the vote by the House Committee, U.S. President George W. Bush attempted to intervene to prevent its passage. With the 2008 presidential election in Armenia scheduled for 19 February, it is hoped that next time there will be more activity in the blogosphere and it has to be said that this looks increasingly likely. In part, this is because the election appears to be more polarized than ever before and there is an urgent need for alternative voices to make themselves heard in between the pro-government and pro-radical opposition media. Such a situation has now emerged after the return of the first President of the Republic of Armenia, Levon Ter Petrosian, in September 2007. However, it was not until October when the former head of state held his first public gathering in nearly 10 years that his candidacy for the 2008 presidential election in Armenia was confirmed. In what can be considered one of the most important political developments in the short 16-year history of Armenia as an independent former-Soviet republic, the country's first president, Levon Ter Petrosian, announced his intention to run again for office in the presidential election to be held early next year. Ter Petrosian had been forced to resign in 1998 by his successor and other high-level officials apparently over what was then considered a concessionary peace deal to resolve the conflict with Azerbaijan over Nagorno Karabakh. What is most significant about Ter Petrosian's political comeback is that had anyone asked most Armenians about the former president's return as recently as two months ago, many would consider that it was unlikely. Now, a day after an opposition rally during which Ter Petrosian announced his candidacy, it is a reality. However, while various media outlets sympathetic towards the former president estimated the crowd at the rally to be between 20-40,000, bloggers such as Observer reckoned it was more like 10,000. As Artur Papyan reported for Global Voices Online, political tensions naturally increased when opposition activists were taken into custody but later released. However, in another post, Global Voices Online reported that the reaction in the Armenian blogosphere was divided. Without a doubt, the most significant event this winter has been the return of the first president, Levon Ter Petrosian, to the political scene in Armenia. Resigning in 1998 and living virtually as a recluse, Ter Petrosian came out of self-imposed retirement on 21 September — the 16th anniversary of Armenia's independence — to launch a blistering attack on the government and his successor as president, Robert Kocharian. Most observers took the criticism as indication that Ter Petrosian intended to again run for office. On 26 October, at his first public rally, he confirmed such speculation by declaring that he would indeed run, but not everybody was happy. While considered an educated and formidable politician and statesman, many Armenians still hold Ter Petrosian responsible for the dire economic situation they found themselves in during the early to mid-90s when electricity shortages were commonplace, and corruption and cases of political persecution sky-rocketed. But as the potential for blogging as an alternative source of information from Armenia became clear, it was Georgia that soon captured the headlines for democracy related events in the Caucasus. 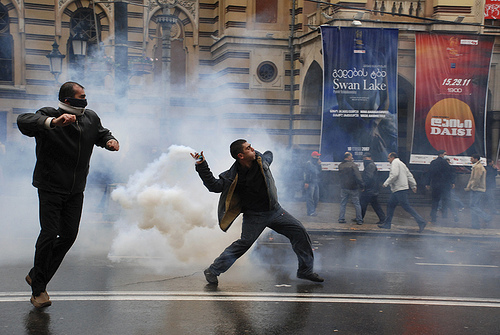 On 7 November, Georgian police used tear gas and more force than was necessary to disperse an opposition protest in Tbilisi. A State of Emergency was declared and democracy in the former Soviet republic which had already experienced a “democratic revolution” in 2003 was once again under international scrutiny. It couldn’t have come at a worse time with all three republics in the South Caucasus gearing up for elections to be held next year. Georgia, considered a beacon of [relative] democracy in the region until today, has set an unfortunate precedent given that the opposition in all three countries will protest leading up to the respective votes as well as afterwards. 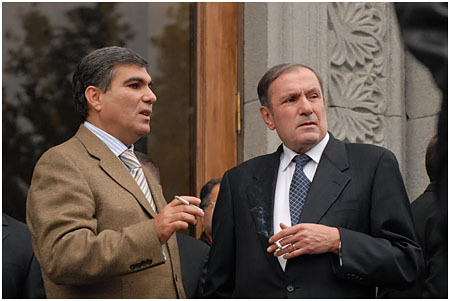 Even the November 2003 Rose Revolution that brought the Georgian president, Mikhail Saakashvili, to power was peaceful in comparison to crackdowns by the authorities in neighboring Armenia and Azerbaijan. An early presidential election has now been scheduled for 5 January 2008, and if the Georgian blogosphere had been previously quiet and rather small in comparison to its Armenian counterpart, that soon changed. 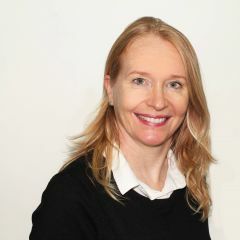 In particular, TOL Georgia established by Transitions Online soon became an invaluable source of information on events, and a human rights lawyer, Anna Dolidze, set up Resistance Georgia, a blog which is now quoted from by the mainstream international media. Other notable blogs from Georgia include This is Tbilisi Calling, the blog of BBC journalist Matthew Collin, and Georgia Ink, the blog of cartoonist Vladimer Shioshvili. If anything, even though still limited in terms of number, the quality of blogs on Georgia soon outstripped that on Armenia. Indeed, even the Georgian press started to examine the role of the Internet in the democratic process and included reference to Global Voices Online as well. You can say what you like on the internet. Some interesting unsolicited material has been circulating as a result of the current situation in Georgia. The political crisis has prompted people to send e-mails to THE GEORGIAN TIMES , and posts to various internet sites, adding their twopennyworth on the unfolding events. Internet activity gives people who have no other outlet the chance to express their views to the world. Every view under the sun is therefore likely to appear. The tone of the internet activity visible so far is resolutely opposed to the government’s actions against demonstrators, and its arguments are based primarily on this occurrence rather the wider range of concerns expressed by government and opposition and in print media. All in all then, a promising year for blogging in the Caucasus although the lack of activity from Azerbaijan is unfortunate. Even so, if elections in Armenia and Georgia are starting to put blogging on the map in those two republics, the presidential election scheduled for late 2008 might well do the same for blogging in Azerbaijan. The example set by Georgian and Armenian bloggers in January and February 2008 might well prove an important catalyst for that. It's also worth pointing readers in the direction of an unprecedented action both online and offline by four Armenian bloggers towards the end of 2007. Anyway, here's hoping that increased quality activity from bloggers on the Caucasus continues, but in the meantime, Happy New Year from the Caucasus section of Global Voices Online. Interesting review – I’ve always liked observing, how real life developments find their reflection in the internet. As you have noted, indeed the Armenian blogosphere is a very vivid one, it is also very diverse and divided (http://ditord.wordpress.com/2007/12/31/to-and-about-the-armenian-blogging-community-in-2007/). With this comment I also want to wish all bloggers more readers and comments. Happy New Year! I enjoyed reading your article. As a publisher of a blog/forum site called the ArmenianCafe, I agree that the internet has give a great outlet for people to discuss issues and feel geographically close to each other.